There was a very healthy and vibrant UPF-UK Peace Council on July 3rd 2010. 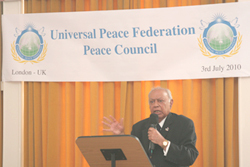 The Universal Peace Federation Peace Council is held twice a year to draw together the strands of UPF activities in different UK branches. Speakers from across the national discussed their interfaith, community cohesion, cultural, environment, peace and development activities. There was a panel discusion on the establishment of Family Associations and a consultation on the feasibility of the Inter-Religious Council. We began to develop a Peace Council for UPF with Committees on topics that inspire Ambassadors for Peace to cooperate together. The Annual Seasonal Gathering in December to review the year and make plans for the following year. During 2006 there were six visits to Israel – Palestine with the Middle East Peace Initiative (MEPI). I have not included the reports. The London Global Peace Festival (GPF) began with a standing-room only plenary discussion hosted at the House of Commons in the Palace of Westminster on the topic “New Paradigm in a Time of Global Crisis.” It included presentations from Mrs Ida Odinga, wife of the Prime Minister of Kenya, the former President of Sierre Leone, Ahmed Kabbah and the former Prime Minister of Slovenia, Anton Rop. 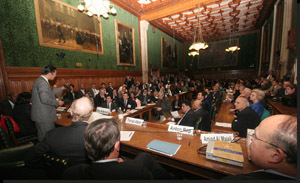 The panel discussion, which featured several representatives from Europe, Africa and the Middle East, was hosted in the House of Commons by Dave Anderson, MP. Anderson recently attended the GPF in Kenya and warmly welcomed the delegates from over 50 nations.“People who want to make a difference in this world are always welcome in this House,” he said. A Tsunami fundraising event was organised from the charity’s headquarters in London. Dr. David Earle of Birmingham gave a report on the Interfaith Children's Home in Hyderabad, India. He met three cabinet ministers in Andra Pradesh to help get new land to extend the orphanage. An interfaith prayer meeting was held at the Children's Home and attended by some eighty people including Hindu priests, Muslims from the local mosque and Christian ministers. A European leader's meeting took place in Rome were planned interfaith activities were discussed.